The biggest reason why the 1963 Corvette is the most significant in the history of the Marque is only visible from below the car. Designed by Zora Arkus-Duntov, a independent rear suspension (IRS) was part of the new chassis. This was a bold move on the part of GM. To put it into perspective, consider this. It wasn't until 1992 - 29 years - after the introduction of the 1963 'vette that a car with an IRS designed by Chrysler (the 1992 Viper) was available to the public. 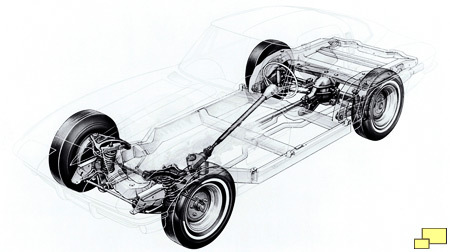 Almost all cars of the time, including the C1 Corvettes, used a live rear axle as the major part of the rear suspension. It's a simple and economical solution that works well in most cases. But the live axle has two problems when used in high performance handling applications. It is heavy. When designing a performance handling car, engineers will go to great lengths to reduce unsprung weight; that is the weight of the wheels and the associated suspension parts that they are connected to. Less weight means that it is easier to control the wheels which means that the tires contact the road surface more consistently. 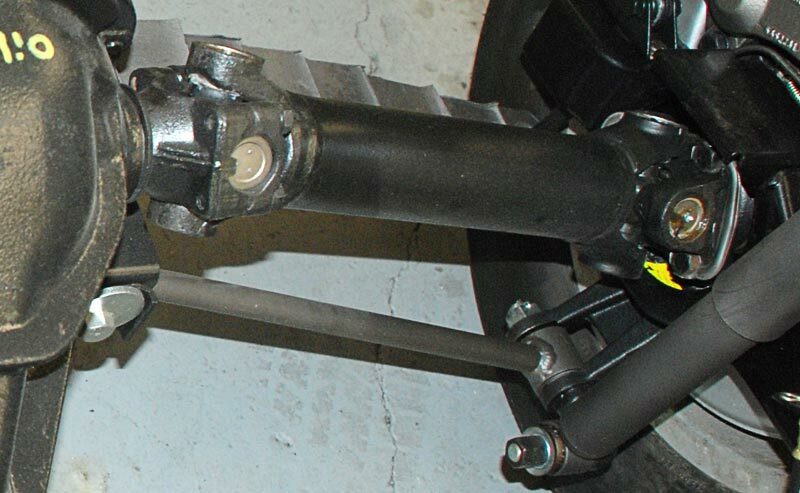 A live rear axle has the heavy differential connected to the wheels. With an IRS the differential is bolted to the frame and not part of the unsprung weight. The IRS deals with rough surfaces better. When a bump or surface irregularity is encountered by a wheel, it does not affect the other wheel. The result is that the tire on the side that did not hit the bump maintains a consistent contact with the road. Pass your mouse over the above drawing to ID the major components. The new IRS was a three link design. 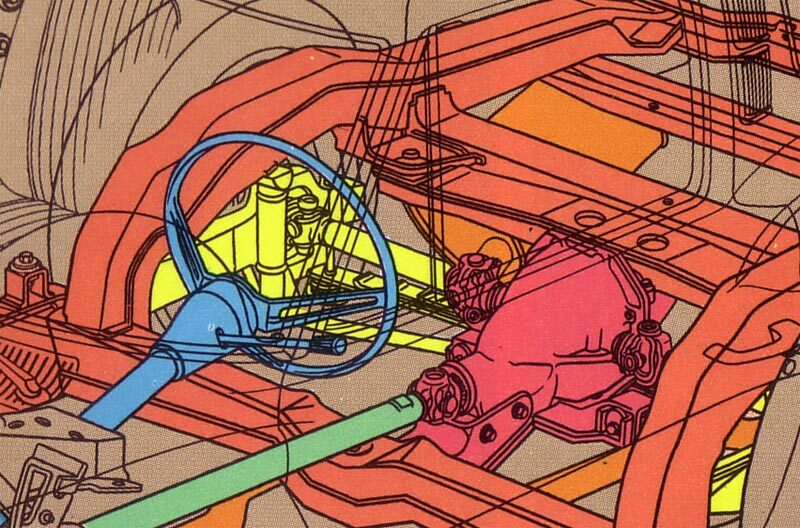 Two of the links, the strut rods and the axle half shafts, can be seen in the above drawing from the 1975 brochure and in the photo on the right. The remaining link, a radius arm running from the frame to the rear spindle support, is visible in the drawing to the right. The extra complexity adds to the manufacturing costs, so keeping it simple was a necessity. An ingenious single multi-leaf transverse spring accommodated both wheels, kept costs under control and featured low unsprung weight. Overall weight was down by about 100 lbs. when compared to the previous straight axle design. New for 1963, the transverse leaf spring in the rear suspension was all things: economical, innovative, efficient, high performing and weight saving. Photograph is of a 1968 chassis which included disc brakes. The chassis was shortened to 98 inches which aided handling. The front suspension was essentially the same as in previous years with detailed changes to improve ride and handling. The steering ratio was adjustable via a simple reconfiguration in the steering arm. Also possible: adjustment of the steering wheel with an underhood change. Power steering was an available option, a Corvette first for 1963. The brakes were enlarged, but the one real improvement - four wheel disc brakes - would have to wait for another time. The IRS was a radical move and positioned the Corvette as a serious road car. The improvement was dramatic and car enthusiasts from all backgrounds took notice. Overall, the handling was much better and so was the feel. The new Corvette was not only faster on the race track, it also felt better. By comparison, the earlier Corvettes felt more cumbersome. The steering feel, agility, responsiveness and "fun to drive" factor was such that even foreign car aficionados took notice. Before the Viper was introduced, the 1989 Ford T-Bird/Cougar was designed and built with an IRS setup. This IRS design was used until the T-Bird/Cougar MN12 platform went out of production in 1997. The Lincoln Mark VIII sport coupe used a similar IRS setup until 1998. The 1997 T-birds could be had with IRS, 4-wheel disk brakes, and a fuel-injected V8 (SOHC no less). What you say is true. I mentioned the Viper because it is often compared to the Corvette and both are two seat performance cars. Let\\\'s see, there is also the Corvair and the 1961 Pontiac Tempest which had swing axle based IRS systems. Very innovative for their time, too bad the concept didn\\\'t gain traction.